If you’re tired of dealing with outdated, ineffective central A/C, fans and window air conditioners, call Rand Aire for a professional ac installation of a new efficient, quiet and effective central A/C system. Increase the comfort level of your home or business, and decrease your energy cost by installing a new air conditioning system. Electricity rates peak during the hottest months, and having an efficient system not only keeps everyone cool and comfortable, and saves money over time. 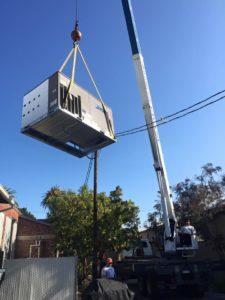 Installing a new HVAC system also improves your home or business’s value, giving you an edge if you decide to relocate or refinance. We’ve all heard the clanging and humming of an old A/C unit outside of a home or business. In the heat of summer, those endless sound emissions can be distracting and unpleasant, so replace that old unit with a new, quiet system. New air conditioners can easily be hidden in landscaping, increasing the professionalism of your business or curb appeal of your home. Plus, a new central A/C is much more efficient than your old system, so it won’t be running as often to keep your home or office a pleasant temperature. This means you can help your wallet and the environment by upgrading your HVAC system. When you decide to install a new A/C system, our professional installation technicians are prompt, courteous and qualified. 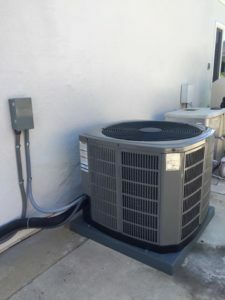 We work quickly so that you don’t have long, hot waits, and we make sure that the job is done right so that you enjoy hassle-free air conditioning. And if your AC unit repair, we can take care of that too. If you have allergies, or just want to keep your family or business environment healthy, consider installing a new central air conditioner. Modern air filtration systems are incredibly powerful and can keep allergens, lint, pet dander and other pollutants out of your home or business. Also consider that new central A/C systems are intuitive and convenient to use. By programming specific times and temperatures, you can increase your efficiency without sacrificing comfort. It’s easy to change your preferences on the thermostat to suit your needs for the day, week, month or year. Need Air Conditioning installed at your business or commercial facility? Rand Air has you covered. We’ve ben serving businesses and commercial facilities across Orange County and for more than twenty years and would love to help you with your next project. Get your air conditioning unit as well as all the venting installed to look great and give your facility a professional modern look. Call Rand Aire today for more information and your A/C installation quote. We guarantee our work and we promise to keep you cool and comfortable all summer long.